SOUL EATER, my version of Snake, but in the dark, and kinda spooky. Now updated to version 1.1, to help low-spec machines play better. I took the engine I created for my 1HGJ game Night Train and updated the artwork, sound, and some in-game mechanics. I'm much happier with this result. It's just a bit late for Halloween, though (or early, depending on when you read this). OBJECT: Eat as many souls as possible before they escape Purgatory. As you eat more, you grow stronger, and longer. Avoid the various obstacles and don't eat your own tail. ENTER KEY: Start/restart the game. ARROW KEYS: Move your demon through the Purgatory arena. ESCAPE: Return to main menu, exit the game. Graphics and event coding by me, in Clickteam Fusion. Background music by DST/Diseased Superior Technician, from the gamesounds.xyz website. Sound effects made with the Lab Chirp tool from the labbed.net website. 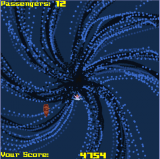 RINGS OF SATURN, a quick score attack game made with CT Fusion and playable in nearly any browser. The object of the game is to collect 20 rings, which frequently appear when you blow up space rocks. You can also collect space gemstones, which increase your score. The faster you collect all 20 rings, the higher your final score. Be as quick as you can, because the bonus timer is always ticking down...! SHIFT KEY/JOYSTICK BUTTON 1 to shoot. When prompted, you can press the R KEY to start/restart the game. Try for a high score. Enjoy! Game and some graphics by me. Made in Clickteam Fusion Dev Edition. Sound effects made with the LabChirp tool. Background music from the playonloop.com website. OTHER NOTES: I've been experimenting with the built-in physics tools for Clickteam Fusion lately, and this is another short project. The saucer's movement is the only one I've been fiddling with in terms of physics here, as well as the positioning of the targeting reticule. The shield that appears around the ship is an artifact left over from some other ideas I had for the game. It's not particularly useful, but it looked nice so I left it in. AUTOMATED TYPER, made for the One Hour Game Jam. This time, the theme was Automation. This is my first attempt at an idle game, and much more of an experiment. Type ASDF in order. When you do, you earn a Cycle. When you have enough Cycles, you can purchase automatic key presses. Purchase all four automatic key presses to complete the game. It can be done, for real. Enjoy! The streamer guy vowed to play the game all the way through to completion. He set up keyboard macros and everything. He went to -much- more trouble than this game is worth, but I am impressed with his dedication. Sound effects made with the BFXR standalone tool, and with the LabChirp tool. BLOCK SLIDE, made for the One Hour Game Jam. This time, the theme was Minimalist. This game plays in nearly any browser. I made an action-puzzle game this time. Guide the Yellow Blocks to the end of their path in the upper left corner. Clear the Slammers out of the way by pressing the 1, 2, 3, 4, or 5 keys. The more that make it, the faster new Yellow Blocks appear. Try for a high score. Enjoy! SFX made in LabChirp. Background music is an instrumental snippet from "Big Check" by the Dirty Marmaduke Flute Squad. PAC MAN, made for the One Hour Game Jam. This time, the theme was Misleading Title. This ain't your grand-pappy's Pac Man! Use your MOUSE to move the hand. Press and hold the LEFT MOUSE BUTTON to grab the Mans and release the button to Pac them in the backpack. Try for a high score! Enjoy! Plays in nearly any browser. Graphics and event coding in Clickteam Fusion by me. Sounds by Atari and Clickteam. Background music is "Aircord" by DST/Deceased Superior Technician, found on the gamesounds.xyz website. 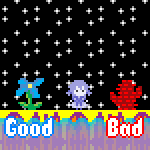 WATER YOUR GARDEN (IN THE MOST MORONIC WAY POSSIBLE), made in a bit over an hour for the One Hour Game Jam. This time, the theme was Going in Circles. You need to water your newly-seeded lawn to help the grass grow. So what better way to do it than to explode water balloons over it with your spiked baseball bat?!?!?! Aim your bat with the MOUSE. Swing your bat by holding down the LEFT MOUSE BUTTON. Summon a water balloon with the SPACEBAR. Start or restart the game when prompted with the R KEY. Avoid walking on the ground you've already watered, or you have to do it again...! Try for a high score, and enjoy! Game and graphics by me. Sound effects made with the BFXR standalone tool and the LabChirp tool. Background music from the playonloop.com website. 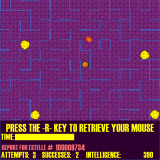 ESTELLE, a short, small game made for the Mouse in the Maze 60th Anniversary Jam. You are directing a mouse and must collect the cheese. Move the mouse with the ARROW KEYS. If you find that you are stuck or the cheese is inaccessible, press the -R- KEY to retrieve your mouse. Go for a high score, and enjoy! UPDATED 12 Jan 2019: Adjusted the movement so it's much more forgiving (and much less bouncy). Added a bit of background texture and adjusted the graphics for visibility. UPDATED 16 Feb 2019: High score should be recorded properly now. Minor fixes to the timer displays. Sound effects made with LabChirp and BFXR. Everything else done by me in CT Fusion. I had a lot of fun making this one, and found myself compulsively playing it. Once you've built your skills, the game can be quite satisfying. WHIRLPOOL, a game made in almost exactly one hour for the One Hour Game Jam. This time the theme was one or both of Can't Stop or Shopkeeper. I chose the Can't Stop theme. Plays in nearly any browser. Rescue the castaways from the whirlpool, and then sail away to escape! The sooner you scoop up and rescue someone, the higher your score. ARROW KEYS to move your boat. R KEY to restart when the game is over. Artwork and event coding by me. Sound effects made in LabChirp and BFXR. I like how this one turned out. I started it by messing around with the Clickteam Physics tools and specifically the Physics Magnet (like I used in You Have to Put the Skull on the Skeleton, but that was a hot mess so I just used other built-in movements for a satisfying old-skool game here. Enjoy! The Naughty Boyz are fed up with always receiving coal in their stockings, so they plan to shut down Santa's coal-mining operation so he'll have no choice but to give them gifts for Christmas. There's only one thing to do while Santa's takin' care of business all around the world: DEPLOY ROBO SANTA! Hold off the Naughty Boyz as long as you can, by throwing candy at them! Avoid their snowballs, and don't be pushed off the screen by the obstacles. The more Naughty Boyz you stuff with sweet treats, the higher your score! ... and One Hour Game Jam!